It's been a few months since I did a monthly favorites post, so we have a lot to catch up on! In order to make this post not a mile long, I really had to ween down the best of the best. 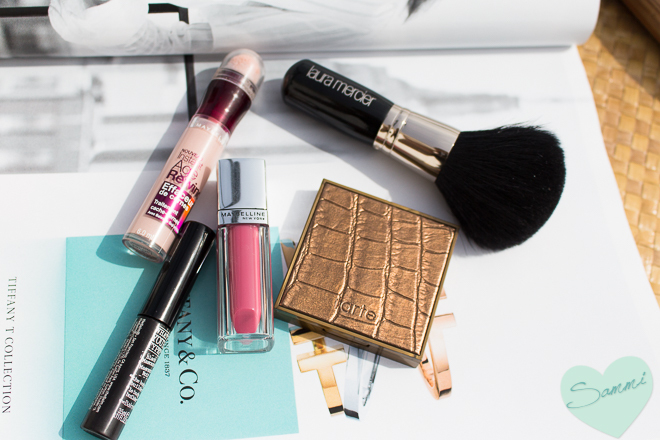 These are the products that I used all summer and will continue to love into the fall. If it's here, it means I enjoyed using it so much that I'd personally recommend all of my friends to get it, too. THE BALM What's Your Type? The Body Builder Mascara ($19 for .4oz) - This mascara has been my jam all summer! A coworker of mine actually asked what brand I was wearing this week because my lashes were so long and flared out! It doesn't look too done-up for every day (like false lashes can), but it also works for nighttime. I got a deluxe sample of this in an Ipsy bag forever ago, so this lasted me about three months. I actually just finished it! If I didn't have a stash of mascaras to use up, I'd seriously consider repurchasing this. MAYBELLINE Color Elixir Lip Color in Rose Redefined ($9 for .17oz) - I received this in my Spring Target Beauty Box and I'm super impressed with it! This rose color is such a pretty everyday color, and it gives such a great glossy shine. It's definitely one of those products where I wanna catch 'em all (like Pokemon), and I haven't seen one of those in awhile. MAYBELLINE Instant Age Rewind Eraser Dark Circle Treatment Concealer in Brightener ($9 for .2oz) - It took me a long time to get on the bandwagon for this product, but I'm so glad I'm on it now! This brightener brings so much light to the undereye area, and as someone who's quite fair with genetic dark circles, this is exactly what I needed. I'm quite surprised with how well it works, considering it's not a heavy-duty opaque salmon concealer. 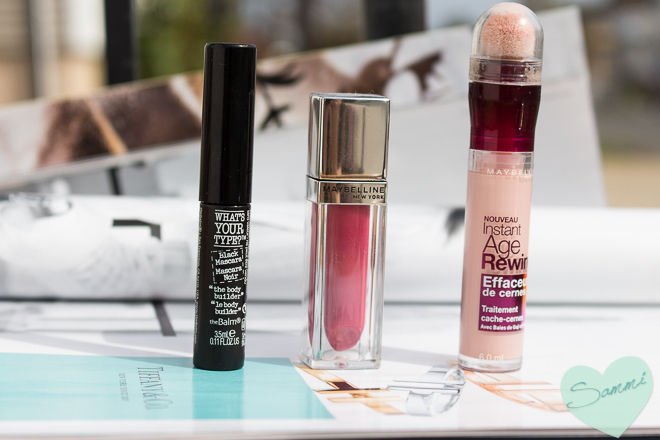 Maybelline's on fire this month! 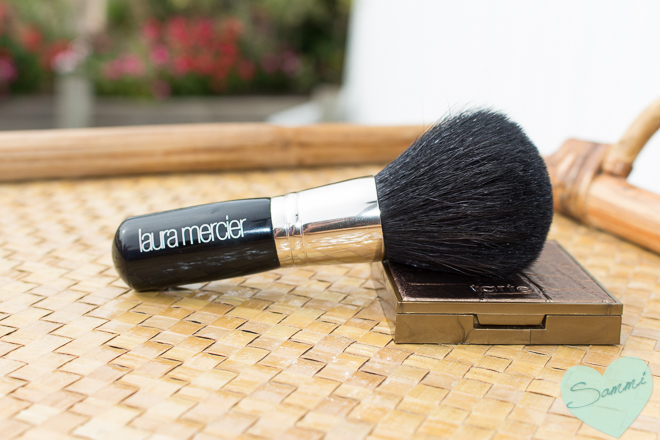 LAURA MERCIER Bronzer Brush ($45) - I was looking for a big, fluffy brush that I could use with bronzer, since all of mine are too dense and deposited too much product for it to look natural. I discovered this while browsing around in the Birchbox shop and decided to take a chance on it. Why are more people not talking about Laura Mercier brushes? They're expensive, but it's such a well-made brush! The hairs are soft, but sturdy inside the ferule, and brush on bronzer beautifully. I can also see myself using it for setting powder. I think this one will last me for a very long time. TARTE Amazonian Clay Waterproof Bronzer in Park Avenue Princess ($30 for .32oz) - I received this in my July Ipsy bag, and it's currently my favorite bronzer that I own! 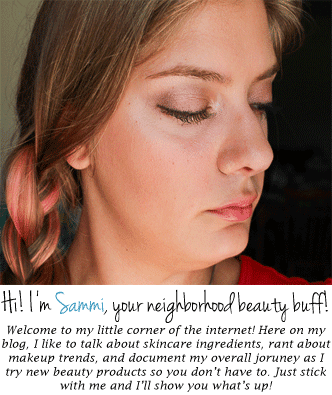 It gives such a natural wash of color to the temples, cheeks, and jawline. It's too warm for a contour on my skintone, but it's great and bringing some color and life back to my face! I have a feeling that when I get pale-going-on-sickly come this winter, I'll be keeping this on hand. 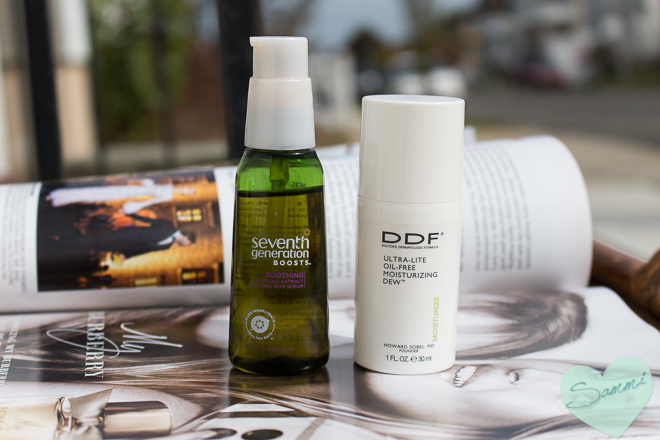 SEVENTH GENERATION Soothing Skin Serum ($15 for 1.5oz) - Oh, how I've missed this serum. I gave it a raving review two years ago, and now I remember how much I loved it! I add a pump of this to my evening moisturizer, and it makes everything that much more luxurious and softer. This will also be useful at giving a lighter moisturizer a boost as we go from summer into the colder months. DDF Ultra Lite Oil Free Moisturizing Dew ($42 for 1.67oz) - I got this deluxe sample in a Birchbox mystery pack with an order, and I'm really happy I got this. As someone with combination skin, this moisturizer is wonderful at providing hydration to my dry cheeks and not making my T-zone look greasy. It's a little heavier than the name implies, so someone with very oily skin might not like this and opt for a lighter lotion. 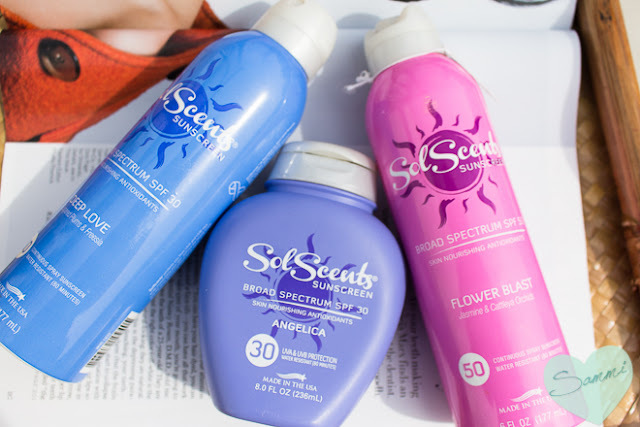 SOLSCENTS Continuous Spray Sunscreens in Deep Love and Flower Blast ($13) and SPF 30 Lotion in Angelica ($13) - Solscents has been the king of my sun protection this summer! I've been using them since my original review a year and a half ago. I'm still raving about them, honestly. Why aren't more people talking about them? It's sunscreen, hydration, and fragrance in one. What's not to love? When I'm feeling lazy, the spray sunscreens are perfect at protecting your skin in a minute. After I hopped out of the shower, I would cover my body in the lotion so I was good for the whole day. They're really fantastic. 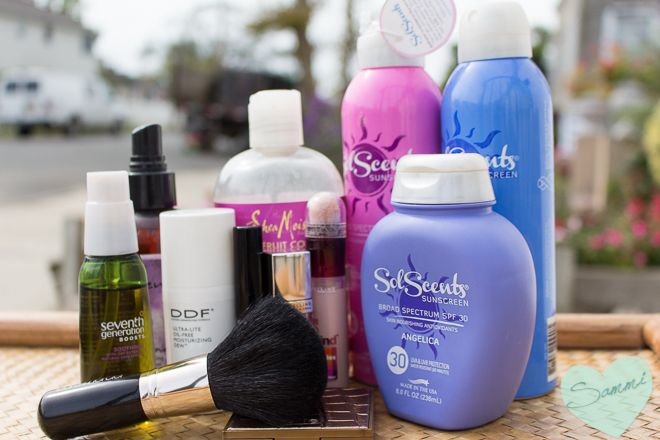 The sprays are also water-resistant, so they're perfect for the beach or pool. Even though summer is over, that's no reason to skip sunscreen! I'm crossing my fingers that they'll come out with seasonal scents, that way people can get their pumpkin scents and be protected, too! SHEA MOISTURE Superfruit Complex Shampoo ($11 for 13oz) - I got some pink streaks in my hair this summer (courtesy of my wonderful, very patient roommate), and artificial color calls for sulfate-free shampoo! 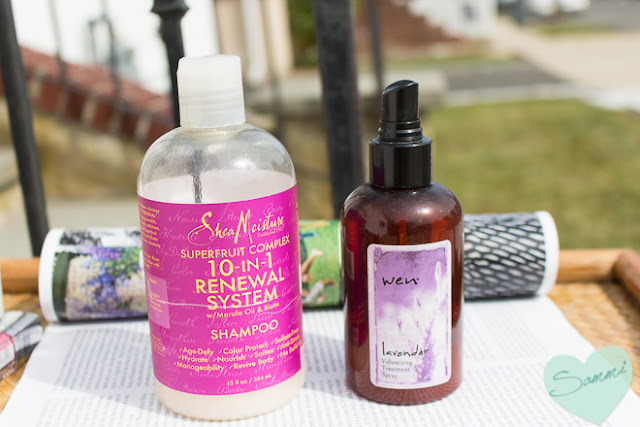 While I was walking through Sally Beauty looking for a good color-safe shampoo, I was so surprised that, despite all of the "sulfate-free" claims on the bottles, so many hair products contained sulfonates or other sulfate-like products! Shea Moisture was the brand that I was recommended at the store as being the only truly sulfate-free shampoo. I'm really happy with this one! It smells good, it's truly sulfate-free, and it doesn't try out my hair or strip my color. I've been using this since I dyed my hair in June, and the color is still there. It has faded from a bright magenta to a softer peach, but in what world would artificial color still be in my hair?? This has become my new go-to sulfate-free brand! My only problem with it is that you need more per washing than traditional shampoo since it doesn't lather as well, but that's just because it doesn't contain sulfates, so I don't mind! WEN Replenishing Treatment Mist ($27 for 6oz) - Going sulfate-free means going silicone-free! In order to wash out the silicones that keep your hair shiny and frizz-free, you need sulfates, otherwise it's going to build up in your hair and make it look greasy. Thankfully, this hydrating detangler contains nothing of that sort, making it safe for a sulfate-free lifestyle. I use it every day just to revive my hair and make it shiny and smooth. The scent also sticks around, so it practically works as a hair perfume. They make new scents every season, and the fall ones sound pretty promising, so I suggest you go and check them out! A bottle is expensive, but you only need a spritz or two, so 6oz lasts me 6 months to a year. Last month, I discovered the KonMari method of folding clothes by Marie Kondo. She's a Japanese decluttering and organization expert, and my life could use a little more organization! I reorganized my whole wardrobe recently, and I'm really happy with how it all turned out. If you're not familiar with it, just Google "KonMari folding" and you'll find a ton of videos and articles on how to do it. It freed up a ton of space in my drawers and bins, and allowed me to see everything that I have. I highly recommend it if you're tight on space! Music-wise, I've been all over the place. I've been obsessed with Meghan Trainor (esp. "Title") and Jack Johnson (esp. "Banana Pancakes"). They're both fun, easy songs to listen to. Jack Johnson has a very "casual Sunday morning" style, while Meghan Trainor is a bit more fun, like getting ready for a night out. Unexpectedly, I've also discovered the wonder that is Fetty Wap (esp. "My Way"). The music on the radio is just so fun right now! Artists are taking genres and really making them their own! What's the best thing you tried in September? Disclaimer: All products were purchased by me, except for the SolScents and the Seventh Generation, which were given to me for free by PR over a year ago. Some links are Amazon Affiliate links, but no one clicks those anyway tbh.